The gold is strong with this one. 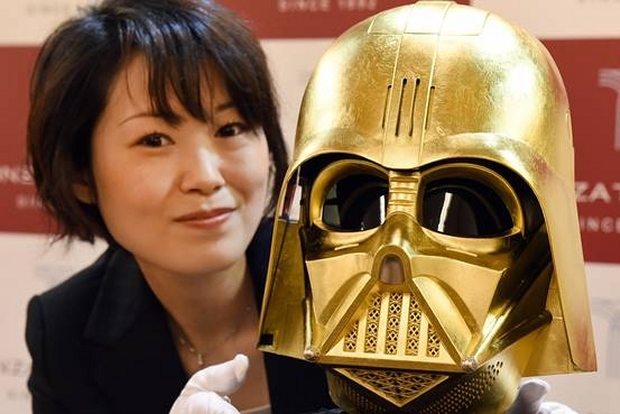 Last Wednesday, a jewelry maker in Japan put a gold leaf covered mask of Darth Vader on display, to mark the upcoming release of its new Star Wars memorabilia, which will go on sale next month. The new items by jeweler Ginza Tanaka include ‘koban’ style Japanese coins made of real gold. These are five gram coins that have the silhouette of Darth Vader. They will be sold for about ¥65,000 (~$544 USD) each. This is obviously for serious and wealthy Star Wars fans. The gold mask was originally created in 2014 and is not for sale. Even if it was, they aren’t saying how much it would cost. The coins will go on sale on May 4, 2015 – aka Star Wars Day.